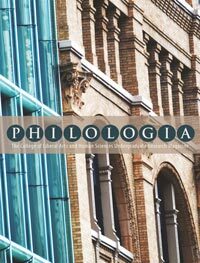 The Philologia is a peer-reviewed, multidisciplinary publication which accepts undergraduate liberal arts and human sciences research from Virginia Tech's College of Liberal Arts and Human Sciences. The journal aims to provide the College's undergraduate students with the opportunity to gain experience submitting research to a peer-reviewed publication, as well as establish an open forum for exchanging undergraduate research, and other scholastic endeavors. Although the journal was established by Virginia Tech’s College of Liberal Arts and Human Sciences, the intended audience includes all undergraduate institutions of higher learning. Philologia is now open for submissions.